5:00 PM – iNSD inspiration from Paige Evans! Hello and happy interNational Scrapbook Day 2017! The best holiday there is 🙂 For this layout I was inspired by the card created by Mendi Yoshikawa on page 69 of the Spring 2017 issue. I love lots of color and the rainbow really spoke to me. So I decided to enlarge the rainbow shape and use it as a focal design element on my layout. I started by looking through the Silhouette Design Store for a rainbow cut file and used design id 73628. 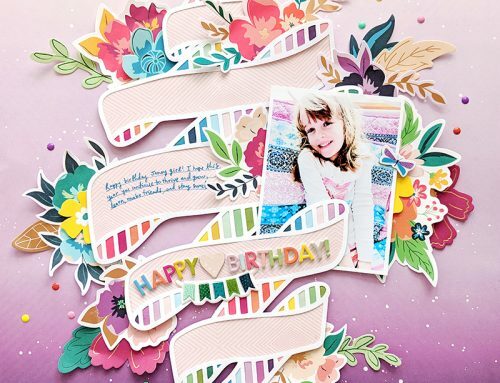 Tip: I die cut each segment of the rainbow from a different color of patterned paper found in my Oh My Heart collection with Pink Paislee and then hand stitched through the center of each piece using the same color of thread as the paper for added texture and dimension. Next I went on a search for some fun clouds and found a cute set of five of them by Lori Whitlock (design id 11654). I die cut a bunch of different sized clouds from textured white cardstock and then stitched around the edges using white thread. I also punched some smaller clouds from vellum. Tip: For the background, I die cut a whole bunch of tiny raindrops from smooth white cardstock and then used a stencil and modeling paste to create a rainlike texture on top. Then I brought in some mixed media and used the packaging technique to apply blue watercolors over the background. Next I backed the cardstock with an ombre blue paper again to mimic rain. Once all of the elements were ready (the shapes, the background, and the photo, which is my son's Kindergarten picture) I pieced and adhered them together to create a fun page inspired by the card! Notice the fox die cut tucked into the photo layer – my son's name is Fox so it had to be done 🙂 For the finishing touch I added sequins to the mix for a pop of shine. Thank you so much for joining us today! I hope it's been inspiring day for you! Each hour our wonderful partners are joining us to celebrate this day and to celebrate you! This hour we have prizes from American Crafts and Your Next Stamp! Happy National Scrapbooking day to all SCT readers! Your Next Stamp is excited to join the celebration! We have a fabulous new release today and would like to invite you to join our new release blog hop tonight at 10pm EST! Sneak peeks are going on all day and we’ve included some of the new products in our SCT prize package today! Enjoy your day! Butterfly Border Die - releasing today! Good Vibes Stamp Set – releasing today! Hello from American Crafts! This American Crafts stash is a craft-lovers' dream: Three different paper collections, game-changing tools, darling stickers, Thickers, and much more. Add celebrity designers Amy Tangerine, Maggie Holmes, Jen Hadfield, and Dear Lizzy to your craft room and let the crafting possibilities begin! Thank you so much American Crafts and Your Next Stamp for an amazing prize package! For an opportunity to win each hour's prizes, be sure to leave a comment below by Saturday, May 13th! Winners will be announced on May 15th. Good luck! Thank you for joining us in our second hour! Be sure to join us each hour until 6:00 pm today for inspiration, tips and techniques from our team and of course PRIZES! If you’re just joining us, welcome and be sure to start at the very beginning for our 8:00 am challenge! I love all the layering. Overall a beautiful page! Great giveaways! Thank you so much to all the sponsors for the great prizes. So generous! Oh I just love the rainbows! The prizes are also awesome. What a lovely introduction to YNS. I wasn’t familiar with this stamp company but will definitely use the link to check them out. American Crafts are one of my favorite companies with an every growing lineup of innovative tools and products. I love the stitching on the rainbow, WOW! This is totally my style. Love the rainbow of colors on both the card and layout! Gorgeous! Thank you for sharing and thank you for the chance to win. The rainbow motif is inspiring. Love the rainbow ?. Trying to figure out how it could be replicated without a cutting machine???? Thanks for making me think a little. Oh Wow such a beautiful sunny and bright layout during all this rain and dull days we have been having. Truly a page to brighten anyones day. Stunning!!! Thank you Paige for this Beautiful rainbow when we most needed one. Happy Spring!! Thank you for this much needed ray of sunshine. I am blown away by all of the fantastic projects I’m seeing today! I’m getting this rainbow cut file and must try this on my scrapbook page. So colorful and inspiring. This giveaway is another winner. Fabby colorful rainbow splashed against the white space! Thankful for chances to win in today’s fun & excitement! Paige Evans is amazing!! Love everything she does!! Wow! Such a neat package to make any scrapper happy! A scrapbook room could always find a home for all of these! WOW – that rainbow is GORGEOUS! It’s so eye-catching. Happy NSD! Love the rainbow lay out! Both sponsors are giving great prizes! Thanks to you for organizing this NSD event and thanks to the sponsors for being generous. Happy Int’l Scrapbook Day! The rainbow layouts are gorgeous! I would love to win the American Crafts and Your Next Stamp amazing prize package. Thank you for the chance to win! Gorgeous page Paige! LOL. That’s dedication to do all that hand stitching! What a fun day it is today! Who doesn’t like rainbows? Or awesome prizes for that matter? Thanks for the inspiration and for the chance to win a prize from these amazing sponsors! Oh my goodness! Such amazing details on this layout! Wow!!! So many great ideas today. Hoping I get to work on some of those layouts tomorrow. Thanks for the great giveaway opportunity. You guys rock! Beautiful rainbow layout! Thanks for the opportunity to win! Oh my, the prizes just keep getting better. getting lots of great pages done and am having a fun ME day. thank you to all the companies that offered all the great products and everyone that posted/blogged for us. What a stunning layout! I just adore it. So many beautiful colors. Thank you so much for a chance to win such great prizes from such great sponsors! Awesome job on your cards, it is so adorable! And I love the layout. Loving the rainbows!!! Such a pretty page!! Love the rainbow with all the different patterns! Can’t wait to give this idea a try. Fantastic prize package!!! Thanks for the chance to win so many great things. I wouldn’t be patient enough to stitch all those strips…but it is absolutely gorgeous when done! Rainbows ? for everyday! What a fun layout! Makes us forget about the rain! love it! Thank you for the inspiration filled day. Thank you for the chance to win. Amazing layout!!! I love all of Paige layouts!!! Love all the clouds and raindrops! That colorful rainbow really pops! Wow, wow, wow! The hand stitched rainbow is stunning! Wonderful prizes–thanks for the chance to win! Love the rainbows. Thank you for all the giveaways. So much happy for such a rainy day!!! Thank you for a chance to win and thank you to the sponsors for the great prizes. Lots of inspiration on here today. Love those colors! So bright and cheerful! Beautiful card and LO….love the colours. Bring on summer!! The rainbow is beautiful! Fun colors and the stitching adds to it! wow wow wow….this is beautiful!!!! Loved this page, so many details yet cohesively put together, fantastic job, the prizes are also great loved the font in the sentiment stamp set. Love the prizes. Great layout with the rainbow! Such awesome prizes! Thank you so much to all the sponsors for the great prizes! So pretty! Oh happy day! I love it soo much! ? I’m giving this one a try! I love the rain and clouds. Love the inspiration today. And another great prize pack. Thanks again for he chance to win. Thank you to two great sponsors who are offering two great giveaways! Such an adorable layout! LOVE colour and love organization; what better way to organize colours than with the colours of a rainbow. Love your ideas, especially the rainbow! Beautiful rainbows on a dreary day. Love these bright, happy rainbows!! I am ALWAYS blown away by Paige’s layouts and lifted one just today…..she is PHENOMENAL!!!! Paige Evans never ceases to amaze me! And speaking of amazing: AC’s giveaway is amazing!! So many goodies. Thanks to Your Next Stamp too. We love you, SCT! Happy iNSD to all. Omg – SUCH a gorgeous layout!!! Wow – more Amazing prizes! Paige’s pages always blow me away! So inspiring! Paige is so talented. I know she puts a lot of effort into her pages. They are beautiful. Wow! So many techniques on one layout!!! It’s simply beautiful!! Thanks for sharing! Loving NSD with SCT!!!!! What a great way to spend a day! Beautiful layout and colorful techniques for rainbow layout! Happy scrapbooking day and ty SCT for great day of creativity n inspiration! # love to scrap and craft! Love American crafts—my favorite paper is Amy tangerine! Great layout and happy craft day..great prizes #love to scrap and craft! Love the stitching. And this may be my fave of your giveaways. Thanks. Omg great giveaways. Thank you! Wow, love these two prize packs! Thanks to America Crafts and Your Next Stamp! The rainbow layout is so pretty! Wow, that is a gorgeous page. Love all of the giveaways! Thank you! Looks like the Silhouette may be on my list of must haves. Love the rainbow and clouds. These prizes from Your Next Stamp andAmerican Crafts is amazing. Thank you. Great products-very generous and appreciated! I love all the color! Off to go play with rainbows! The rainbow icon is one of my favorites to play with. So love the inspiration card. Thanks! The texture and happy colors are fantabulous on this page! Love the colorful inspiration!! Thank you for all the awesome fun today!! wow—I adore the stitching on Paige’s layout–she is so talented! Love your page Paige. Thank you SCT and the sponsors for the giveaways. I love rainbows & the stitching adds an amazing dimension to the whole page! Thanks for the great prize opportunities too!! Love Paige’s work!.What. Great day!. Excellent idea. Thanks for the opportunity to win. Best Rainbow ever- love the dots! Love Paige’s work. Always clever. WOW!! That card and layout are STUNNING!!! Thank you for the inspiration!! All that stitching, yikes, that is a labor of love. Great prizes. Thank you to Your Next Stamp and American Crafts or your generous prizes. Love these two companies such great prizes! I think National Scrapbook day is my favourite day of the year! What an incredible layout by Paige! Gorgeous! Love those clouds and the stitching adds so much! As always, I adore Paige’s colour filled stitched pages! What a fabulous texture rich layout! Thanks to American Crafts and Your Next Stamp, who I only recently discovered, for your generous prize donations! Those ideas are amazing and fab prizes with some of my favorite things. I love those Whatnot Sentiments! Love the rainbow! thanks for the chance to win some great prizes. Love the rainbow that was shared in the layout by Paige. Great prizes too. Thanks,. Anything rainbow is always sooooo cute! Love all the stitching! LOVE those stitched clouds, Paige! A beautiful inspiration! Those American Crafts goodies look TOO good! Awesome! I love the bright rainbow colors. And I love the giveaway, too. Sending hugs your way for a fantastic giveaway! Beautiful rainbow layout. Paige always does amazing stitchwork on her layouts. Another amazing prize. Never would have thought to put a fox and a rainbow together, but how cute did this turn out. Love all that stitching. Such a labor of Motherly love! Beautifully!!!! Love the stamps from Your next stamp! Love your rainbows! The card is so cute…. Wow–all that detail and the hand-stitching! A lot of love went into that layout. 🙂 Great giveaway too! Both layouts are gorgeous! Love those goodies! Love the design. So cool. These giveaways rock! Wow, what a wonderful layout this is! Love all the textures. What a gorgeous page! I love this! Rainbows are my favourite. Reminds me of my old rainbow jeans when I was a kid. Love the stitching and the layering. Thanks for the inspiration! WOW!!!! Look at those gorgeous pages and GENEROUS prizes! This is one happy scrappy day for us paper people! Thanks to Your Next Stamp and American Crafts. Just wow. I absolutely love that rainbow! Wow – that layout is amazing! I am super impressed. Those will brighten anyone’s day. Great prizes! I printed that page of the magazine to give it a try. The prize package would be used to accomplish this. Thanks for the opportunity. Imagine having our own scrapbooking day! As I sit here waiting for our dinner we ordered, we are all making the same cards. I am grateful for my friends and the kinship we have. Hope everyone had a great day and look forward to the rest of the year doing our craft and look forward to next year!!! Wonderful giveaways…thank you YNS and American Crafts! And I love the rainbow ideas! Awesome love the rainbows and the bright colours!!! Sct you rock!! I love the rainbow colours on both the card and layout. Amazing prize! I am a fan of Your Next Stamp! Their stamps are so whimsical and of excellent quality. Live that they are Canadian too! Thanks for the chance! that rainbow is awesome and the hand stitching is just beautiful, not to mention the amazing prize from AC – I would absolutely just love love to win this amazing prize today.. I love your rainbow layout and the stitching is spectacular! Wow! Thanks to the very generous sponsors for the amazing giveaway! Incredible layout, love that rainbow and all the texture on this page! The layout is gorgeous but best part for me is the tip about hand stitching paper pieces – it looks as good as machine stitching and adds a great touch. Another great giveaway. I love the rainbow layout and card–lovely! Thanks to these great companies for the gift packages, how awesome! Love the rainbow on your layout-another great prize! Love the stamps and dies! oh my gosh, I love the card, and that layout is so detailed and beautiful! Lots of love went into it for sure!! 🙂 Thank you so much for the awesome giveaways. What neat stitching, I could not do that. Love the rainbow! Nice prizes also. Gorgeous layout. I love all of the stitching and the little details. Oh wow! Paige! This is the most beautiful thing I’ve seen all day! Absolutely terrific! Love the card and the layout! The colors are amazing! American Crafts and Your Next Stamp – thank you for being sponsors. Love these ideas (pinned them!) Fabulous prize package! Thanks for the chance to win! Layers and layers cuteness! The picture and the layout go great together. I’ve never heard of your next stamp before, I will have to check them out. Love the card, so fun and bright. I think this is one of my favorite pages of the day. Thanks Paige! All prizes are great but that American Crafts stash – awesome! Very impressive layout. I love the stitched details. And two more amazing prizes! Thanks! Thanks for the beautiful layouts!
? Rainbows and foxes ? what more do you need! ❤️American Crafts and Your Next Stamp thanks for the chance to win! Love the butterfly border die! What an intricate and beautiful layout! LOVE these RAINBOWS of AWESOMENESS! Rainbows make everyone smile – great layouts. Foxes, rainbows and stitching…oh my! Ute rainbows rad and layout. Even though it’s almost the end of the day, love all the inspiration and fun. Thanks to all the sponsors; great giveaways. Love the beautiful rainbow layout! Methinks that this is an absolutely incredible prize package! Would love to have it headed my way! Fingers crossed ?TFS! Love the rainbow page!!! Fabulous giveaway! Awesome stitching! Thanks to all the sponsors!! What a way to welcome spring – rain, rainbows and sunshine. How inspiring!!! Love the hearts as raindrops. Great prize from AC! Now that layout takes talent and a whole lot of sewing patience. Great job. Thanks for a chance to win. Rainbows make everyone happy! Love these! The rainbow layout is so much fun! I love it! Prizes are awesome! The bright colors on the projects are wonderful! Woah. That rainbow layout is wonderful. It is a wonderful holiday!! I love the card inspiration and the layout! The design is so bright, and happy, and fun. Gonna pin and use! What a gorgeous layout! Thanks for the inspiration and the chance to win those fabulous looking goodies. What a stunningly gorgeous layout by Paige Evans. Love all the colours and detail on this page! Awesome prizes this hour! Does Paige Evans make the most beautiful pages or what!? Look at all that stitching! 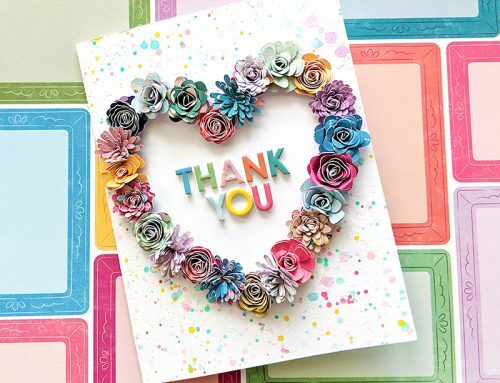 Love these generous prize packs from American Crafts & Your Next Stamp too! Love the Toucan stamp! Sweet! American Crafts? Wow! What a prize giveaway! Super duper love! How fun! What amazing ideas to play with! Love the colors and feel good vibes! Oh. my. goodness! What a little cutie smiling huge for the camera – and nestled into this GORGEOUS rainbow and embellished pops of color page! I’m in awe of it’s beauty and cheer and whimsy! Love this so much – thank you for the inspiration! Love the rainbow theme. Beautiful layouts. Thanks Your Next Stamp and American Crafts for sponsoring this giveaway. WOW, love American Crafts and all they offer to the scrapbooking community! This lovely prize has a wee bit of everything! Would be over the moon if I won…have been looking at the Banner punch board for awhile now!! I love love this layout! Especially the colored stitching! Love the rainbow. It was great to see how you took the inspiration and made your layout step by step. Cool layout! Love the YNS Gumdrops too! I’m loving this colourful layout! The subtle details like the sequins are gorgeous too. Loving these fun rainbow projects. Loving these fabulous prizes too. Amazing giveaways! 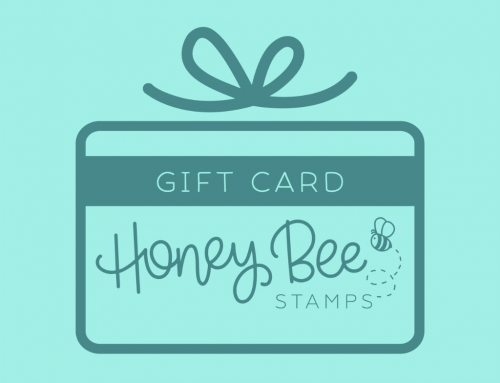 Thank you to American Crafts & Your Next Stamp, and thank you SCT for the chance to win! What a fantastic prize! I’m in love with rainbow layout – but sadly, I’m not sure I’m talented enough to make it. Beeeautiful rainbow I love the vivid colours ❤? Thank you tot sharing this cool tutorial. Now it feels like I can have one more ‘workshop’ from you after all ? What an amazing layout – especially love the rainbow! So many elements that look wonderful together! Absolutely in love with this beautiful LO! So fresh and simple. Love it! Paige is amazing artist, love this rainbow. I love everything Paige makes! I love all the different techniques used to create the layout – beautiful! Paige Evans always comes through! This is adorable! Love the design and colors! Happy National Scrapbook Day everyone! Rainbows make me happy. Thanks for the chance to win. What a beautiful layout. Can’t imagine the hours that went into all the detailed stitching. Great layout, love the rainbow! Awesome event! Great prizes! LOVE, Love, love this layout! Love the colors, so bright and cheery! Thank you for sharing! So many great products and companies. Love them all. Thanks for all the great inspiring ideals. Thanks SCT. I love rainbows!! What great prizes too!! Love both of those projects. So happy and fun! Wow! The prizes just keep getting better! Thank for the fun day! OMG I love this layout Paige! So beautiful and full of colour!! And an amazing prize too! What an amazing layout. Love all of the stitching details. Thanks so much for all of these wonderful giveaways and the beautiful inspiration! Beautiful card & LO, love the rainbows!! holey cow!!! the rainbow layout is beyond amazing!!! Love the rainbow in the layout. Thank you for a chance to win great prizes! I love all the fab details in this terrific layout! What exciting prizes from such fab sponsors! Another gorgeous page!!! Your creativity is spectacular!!! I love it!! Love rainbows, they just make me happy! Great layout! Paige’s layouts are works of art…literally. Wonderful pops of color and fabulous sewn texture too. So many great ideas that my mind is reeling! 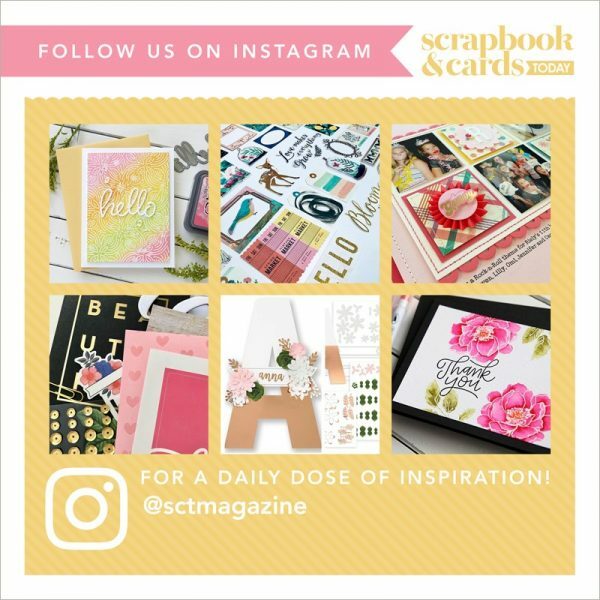 Love National Scrapbooking Day and SCT Magazine and all the amazingly generous sponsors! Seriously fun! Those are great prizes. I haven’t heard of Your Next Stamp before, I’ll have to check them out. Thanks!! Thank you AC and Your Next Stamp for the giveaways! Whoo hoo! I love rainbows and these projects are so eye catching! Great job ladies! Love that rainbow on this layout! Beautiful layout! Thanks for the chance at your prize! I Love how you did the rainbow! Just beautiful! Thank you for the great prizes! Love both companies! Lovely layout – thanks for all the tips! Thanks to all the vendors providing prizes for NSD! Cute layout! Thanks to these awesome sponsors! I love them both! What an awesome prize from American Crafts! Hello! Come home to momma! Thanks for the chance to win! Love the layout inspired by this cute rainbow card. What an amazing background! So gorgeous and yet the photo is still a focal point – love it!! What a beautiful rainbow! The stitching using same color thread adds the perfect touch! Thank you for the inspiration! oh my goodness! It’s so cute and I just love the rainbow and clouds! Beautiful layout from Paige! Love these so much!!! Inspired by all the ideas posted on the blog hop!!! Paige, your LO is so beautiful! I love looking at all the details you have added with the layers, the stitching, the colours, and the techniques you used. Its more than just another LO, this one is frame worthy! LOVE rainbows! And i love the layering of the clouds! I’ve always loved rainbows! Adorable card and layout. Paige’s page is so sweet! Happy (inter)National Scrapbooking Day! WOW! That’s quite the prize package! My fingers are crossed! Love the rainbow layout. I am so impressed by all the beautiful detail! You inspire, Paige! Thank you! Thanks for the fun, SCT! first – the rainbow card is adorable! but Paige’s layout is nothing short of amazing! so special! and the prizes this hour are fantastic! Super duper fantastic layout!!!! So colorful and layerful! Made up a word there….lol! Wow! What great prize packs! such a super cute layout- love the rainbow and the fox peeking out! Stitched clouds and rainbows, what a sweet layout! WOW – that is a lot of work on that layout!! Some many details…I am blown away. And then those prize sponsors are extreme. Thank you for the chance to win! Love the beautiful colours of the rainbow!!! ??. All we are having here is rain, rain and more rain so seeing a rainbow would be very nice!! The amazing YNS and American Crafts products would certainly be welcome in my craft room. Absolutely love the rainbow and it’s bright cheerful colours. What a wonderful prize package from YNS and American Crafts. Thanks for chance to win. Stunning!!! I wouldn’t have thought to die cut the water dropplets, but see myself doing it in the future. Thanks for the inspiration! Gorgeous layouts! I love the stitching and layering, thanks for the inspiration and giveaways. Oh my word…. fabulous prize package! Love rainbows and clouds! Those stamps are cute! Love these rainbow ideas! Fabulous prizes too! Happy NSD weekend to all! Love the stitching done on the rainbow and clouds. What great prizes from American Crafts and Your Next Stamp. They both were very generous. Ooh! I love rainbows. The stitched rainbow is very beautiful!! Beautiful details on the layout. What a bright, colorful page. LOVE that rainbow with those fluffy clouds! And love the idea that HE is really the pot of gold at the end of the rainbow. I will store this one away to craft with another day. And I love those pretty sprinkles. Who couldn’t find a home for those in their stash? Wowzers…there’s a lot of beautiful work into your layout. Just gorgeous and LOVE all that stitching. The rainbow is awesome. Very nicely done. Many great ideas today. So exciting. I hope to participate more this week. Beautiful rainbow. What an awesome set of Prizes! Yay! Wow! Love the layout! And thanks for the fun giveaway! Fabulous prizes and I just love the rainbow! I love that Toucan stamp set from YNS and anything from American Crafts is always fabulous. Thank you for a chance at so many prizes. Great giveaways and a wonderful rainbow of colours for the inspiration!! Paige always comes through with such beautiful, detailed layouts. Would love these prizes. Thank you! What an awesome prize package. I love it all!! I love American Crafts. They have always been a favourite of mine – since the early days of my scrapbooking! Paige Evans always does such amazing interesting intricate designs. Thank you for the chance to win amazing supplies! Happy NSD! Thanks to Your Next Stamp and American Crafts! This is so cool! Thank you for the opportunity to win! What an amazing layout! Such attention to fine detail but worth the effort!! Thanks for the inspiration and tips and chance to win! Woot woot american crafts and your next stamp. Love all the products. And amazing layout. Love the fox. love what you created! thanks for the chance to win! Love the rainbows. How bright and pretty. & So much NSD fun and awesome giveaways. Lovely colors and an inspiring layout! Love the layering and the awesome prizes. Thank you so much to all the sponsors for the great prizes. This wonderful inspiration gives us many thanks! Oh my goodness, what a beautiful page! That’s a stunning layout! Beautiful layout with the rainbow and the clouds. What a cool card and great layout…love anything rainbow. Love the rainbow card and that layout is ” Over the Top” beautiful and cute !! American Crafts has outdone themselves with this prize pack, Wow!!! Thanks to both sponsors. Gorgeous – love the layers and the touches of painterly colour. What a wonderful addition to my stash! Love all the attention to detail you put into this wonderful page! Wonderful prizes, must have gumdrops!!! Wow!!!! Thanks for the chance to win. What a gorgeous layout with the rainbow and puffy clouds! Great idea!! I will be trying to make both a card and a scrapbook layout. I love the textures on your page and I always love your designs. Stunning page and amazing prizes! Thank you SCT, American Crafts and Your Next Stamp for your generosity and making this all possible. Love the hand stitching… brings me back to my first card stitching as a child. what a beautiful page – and an exciting prize package! Thanks to American Crafts and Your Next Stamp for these great prizes. super cute rainbow ideas! thanks for the chance to win! Rainbows always makes me happy, and these are lovely! Beautiful page – awesome prize package! Very creative ideas. Love the layouts. The We R punch boards are so fun! Love those gumdrops!! Super cute prizes this hour. such clever use of layerings on layout, adding interest to the texture! I love YNS and would love a chance to win! The clouds and that background is breathtaking! I can’t get enough of it! Stunning!! I’ve never heard of Your Next Stamp, so I’ll go check them out. These stamps are great, and I really LOVE the gumdrops! Awesome colors! Now, American Crafts … you’re killin’ me with these punch boards! I’ve got sooo many of them, and I love them all! Now, a MINI alphabet punch board? Be still my beating heart! This prize is way beyond generous! Hats off to you!!! Thanks! That layout is amazing – such awesome detail! What an exciting product giveaway inspiring the best creativity! Another great giveaway! Especially love all the papers! Love the stitched rainbow. Awesome prizes this hour and thanks for the chance to win. I adore the rainbow on the layout! So lovely! Wow! Prizes…generous or what! Oh my! I love the rainbow. Great inspiration all day long. LOVE Paige Evan’s layouts. This layout is just incredible! I love how she created the rainbow design. The detail she added is absolutely incredible. The little fox, and the rainbow–adorable. Love the rainbows and the layering. Love to be in to win these awesome products. Love this layout! Love love love American crafts would be ridiculously happy to win this prize. Thanks for this opportunity! Wow, that layout is an absolute treasure trove! No pot of gold needed when there’s so much wonderful detail. Amazing work! There, yet but will get there–someday! Ok I have such a thing for clouds right now – so your page has got to be one of my fav NSD inspirations. Not to mention that amazing rainbow. I can imagine that took some time to create and it was well worth it for such an awesome page! WOW WOW WOW! What a perfect photo paired with a gorgeous and colourful layout. And this giveaway is jam packed with AMAZING products. Thanks for the chance. WOW is all I can say for the beautiful layout and prizes! Such a darling layout with the rainbows! The prizes from American Crafts and Your Next Stamp are wonderful, thanks for the opportunity to win them. Love the card and the idea of sewing on a layout! So fun! Awesome prizes. I would love to win that set. Love the rainbow! It is beautiful! I am always amazed at the amount of stitching goes into Paige’s layouts. I love this gorgeous rainbow layout! Thank you so much for the inspiration and the opportunity to win! Incredible details on the layout from Paige – all that hand stitching wow – beautiful work! 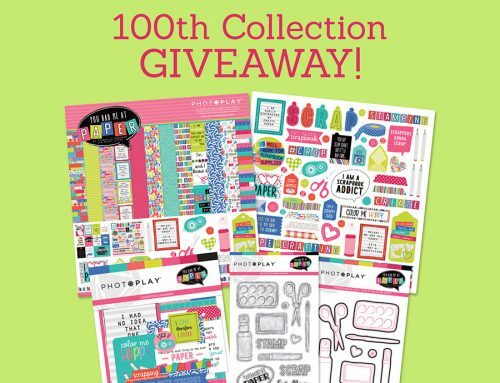 Great giveaway from Your Next Step and American Crafts – way too generous! Thank you SCT for the inspiration and the great giveaways today! Love the rainbow creations and fabulous giveaways! What an amazing layout! Thanks for the opportunities for such great prize packages! I love rainbows! I can’t believe I have never thought of doing something like this with rainbows! I totally have to do this! Love Love Love!!!! Beautiful ideas! Thanks for the chance at a great giveaway! Gorgeous rainbow. And amazing prize packs.